Craig Levein has accused referee Bobby Madden of an “abysmal” performance in yesterday’s fiery Hearts-Rangers match at Tynecastle Park. The Hearts manager felt visiting striker Alfredo Morelos deserved a red card as an offside goal by the Colombian was allowed to decide the game 2-1 in Rangers’ favour. Levein felt the match officials let his team down with a number of decisions. He revealed that Madden warned Hearts not to view video footage of incidents and then complain to him. After Rangers defender Connor Goldson scored to cancel out Gareth McAuley’s own goal opener, Morelos scored from James Tavernier’s free-kick before half-time. Television replays proved he was offside. Rangers midfielder Scott Arfield was red carded for a crazy lunge on Hearts goalkeeper Zdenek Zlamal during the second half. That did not appease the home camp, who were left raging that Morelos’ goal stood. “Austin MacPhee [Levein’s assistant] phoned John Fleming [head of referee operations at the Scottish Football Association] because we had three offside goals given against us because the linesmen made mistakes. John Fleming suggested we held our [defensive] line on the 18-yard line to make it easier for his officials,” claimed Levein. Asked if he spoke to Madden, Levein replied: “What’s the point, unless he’s got a time machine to go back and fix his mistakes. “He [Morelos] had loads of fouls. He wasn’t even watching the ball, he just jumps into the centre-backs. There’s one where he smashed Christophe Berra. Bobby said to one of our players: ‘It’s just Morelos, he’s a bit silly sometimes.’ Well, I’m going to tell our players to be silly because you don’t get booked for being silly. I thought it was an abysmal performance. Levein noted some positives from an improved Hearts performance in which Berra made his return from a four-month injury absence. 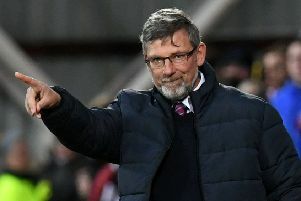 “I thought we deserved something from the game because we had some really good chances,” said Levein. “We matched Rangers for the majority of the game. “We had more play in their half than we’ve had for a while. “We were much better than we’ve been. Sean Clare is getting closer to being what we know he is. I thought Arnaud Djoum was excellent. “I can’t speak highly enough of Christophe after his performance given the length of time he’s been out. He’s back weeks before he should be. “I had thought about having to take him off to protect him but I couldn’t with the nature of the game. He was excellent given the time he’s been out. We miss him. You saw just how much of a difference he makes to our defence. “We had good chances and I thought Allan McGregor was excellent, first half particularly. “I take great encouragement from the fact we were much better than we have been. It would have been more tangible to get something out of the match.